A great experience from ordering ticket to the gig itself. Was the first time I had used Gigantic to get concert tickets and I cannot fault them. Ordering tickets on the website was straight forward and ticket prices were in line with other web sites with the tickets arriving within a week. Plenty of time before the gig so no biting finger nails waiting for tickets to arrive as it gets closer to the gig. The gig itself was absolutely fantastic. The Asylum nightclub is within the grounds of the Hull University and is easy to find. As for Black Star Riders, they put on a great concert with a good selection of songs off all 3 albums and a few Thin Lizzy tracks included. How could you make things a bit better ? Apart from that I honestly don't know. In all I had a great night. An easy 5 out of 5 from me. "A great night of rock"
This was the best bill for a gig I've seen in some time. Four bands for less than £30. Dirty Thrills, Tax The Heat, Blues Pill and the amazing Black Star Riders. As a long time Thin Lizzy fan I was glad they only played Jailbreak & Whiskey In The Jar and the set was mostly BSR originals. They don't need to rest on the laurels of Phil Lynott when they have 3 albums of excellent material to draw from (and another on the way apparently). Scott Gorham's guitar playing is a good as ever & Ricky Warwick remains a great front-man. All three support bands were exceptional and got the crowd behind them. All in all a great rocking evening! "Another great Black Star Riders Performance!!" This is the third time I have seen the Black Star Riders this year, yet another fantastic performance, their first 3 albums are brilliant and to see the songs performed live with such energy is just amazing.The Junction in Cambridge is one of my favourite venues as no matter where you are you are close to the stage!! Three great support acts, The Blues Pills, Tax The Heat and Dirty Thrills made it a great night!! This band rocks and were on top form, each band member an excellent musician. Hard rock band Black Star Riders consists of the surviving members of Thin Lizzy. Continuing to write and record their own original material, the band is an evolution from their origins and is the next chapter in the story of Thin Lizzy. 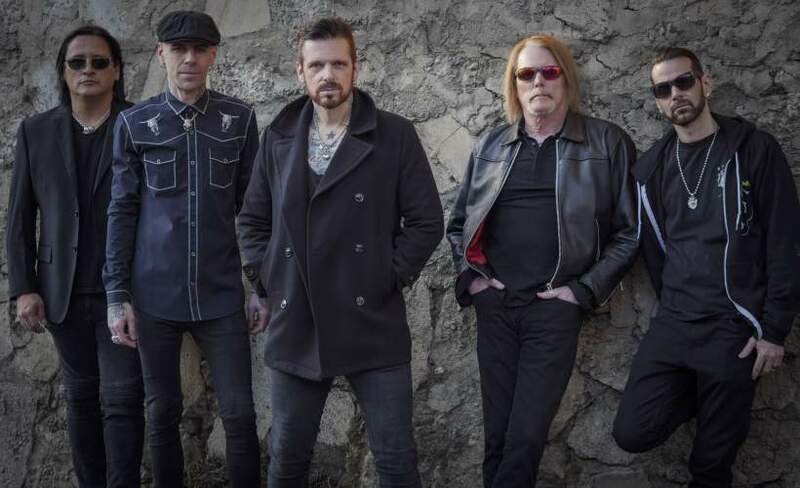 The band members include drummer Jimmy DeGrasso, lead guitar from Scott Gorham and Damon Johnson with vocals from Ricky Warwick and Robbie Crane on bass. They are about to hit the road for an extensive UK tour to promote their upcoming album Heavy Fire. The band began in May of 2010 when Gorham reunited with former Thin Lizzy members Downey and Wharton. Recruiting additional members, they hit the studio and began to demo new material. However, in respect to departed front Phil Lynott the decision was taken to work under the new moniker; Black Star Riders. Their first album release came at the start of 2013 with All Hell Breaks Loose. Featuring new material and capturing the raw live sound, the album was a hit with critics and rose to #25 in the UK album charts. This was followed in 2015 by their second album The Killer Instinct which was even more successful hitting #13 in the charts. Their latest album, Heavy Fire, was their first to break the Top 10 whilst also topping the Independent Albums chart in the UK. Expected later in the year, their highly anticipated upcoming album will be called Another State of Grace. Black Star Riders tickets will soon be available through Gigantic. They hit the road to play a whole load of unmissable shows during October of 2019, including O2 Academy Bristol, Cambridge Corn Exchange, O2 Shepherd Bush Empire in London, William Aston Hall at Wrexham, Rock City at Nottingham, O2 Academy Newcastle, O2 Manchester Ritz, De La Warr Pavilion at Bexhill, Cardiff University Great Hall, KKS Steel Mill at Wolverhampton and O2 Academy Leeds. We only have limited supplies of Black Star Riders concert tickets on sale so please book early or you risk missing out on seeing this incredible band perform live for yourself. We are proud to offer you excellent customer service on a huge range of essential gig tickets so make Gigantic your first choice whenever you book your big night out. We know that it is easy to forget when your favourite act goes on sale. So, place a personal reminder with Gigantic and then we can alert you with a text message or an email just prior to their release of Black Star Riders gig tickets at 10:00 on Friday 8th of March.